Stele dedicatit tae the remembrance o massacred students. 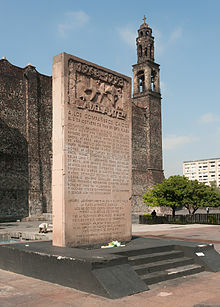 The Tlatelolco massacre, kent as The Nicht o Tlatelolco (frae a beuk title bi the Mexican writer Elena Poniatowska) an aw, wis the killin o student an civilian protesters as well as bistaunders bi Mexican govrenment employees that teuk place durin the efternuin an nicht of 2 October 1968, in the Plaza de las Tres Culturas in the Tlatelolco section o Mexico Ceety. The violence occurred ten days afore the 1968 Simmer Olympics celebrations in Mexico Ceety. While at the time, govrenment propaganda  an the mainstream media in Mexico claimit that govrenment forces haed been provokit bi protesters shuiting at thaim, govrenment documents that hae been made public syne 2000 suggest that the snipers haed in fact been employed bi the govrenment. Awtho estimates o the daith toll range frae thirty tae three-hunder, wi eyewitnesses reportin hunders o deid, Kate Doyle—a Senior Analyst o U.S. policy in Laitin Americae—wis anerlie able tae fynd evidence for the daith o forty-fower fowk. Accordin tae the reports o the heid o the Federal Directorate o Security 1,345 fowk wur arrestit on 2 October. ↑ Mexico '68: An Analysis of the Tlatelolco Massacre and its Legacy, Kara Michelle Borden, thesis, p. 3. ↑ "Mexico '68". National Public Radio. Retrieved 27 July 2010. ↑ "Memories of Massacre in Mexico". Washington Post. February 14, 2002. p. A21. ↑ "Mexican leaders vow to open books on massacre". The Miami Herald. October 3, 2001. ↑ "Unveiling A Hidden Massacre: Mexico Sets Honors For 300 Slain in '68". The Washington Post. October 2, 1998. ↑ Joe Richman; Anayansi Diaz-Cortes (December 1, 2008). "Mexico's 1968 Massacre: What Really Happened?". NPR. Retrieved 27 July 2010. ↑ "The most terrifying night of my life". BBC News. 2 October 2008. Retrieved 27 July 2010. "Human rights groups and foreign journalists have put the number of dead at around 300." ↑ Fernando Gutiérrez Barrios, "PROBLEMA ESTUDIANTIL", 3 October 1968, in ADFS, Exp. 11-4-68, L-44, H-292. This page wis last eeditit on 17 November 2015, at 08:31.